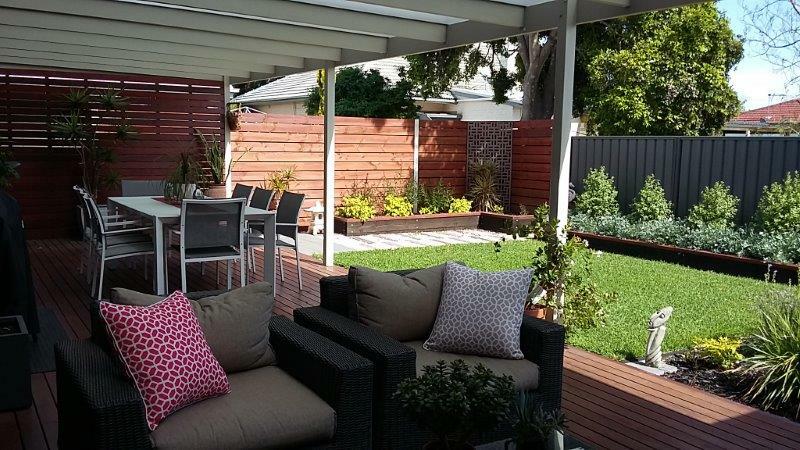 Hard landscape Architecture such as pools, conservatories, pool enclosures, decks, patios, verandahs, pergolas, gazebos, outdoor kitchens and dining areas is all about utilising those alfresco spaces and enlarging the size of your livable space in the warmer months. The trick is to visually tie the Architecture together with planned plantings and hard landscaping that blurs the boundaries between inside and outside, making it all one space. This addition to a 1960's cream brick Jennings home showcases how a twinwall polycarbonate roofed alfresco area and garden when designed together blurs the boundaries between inside and outside. 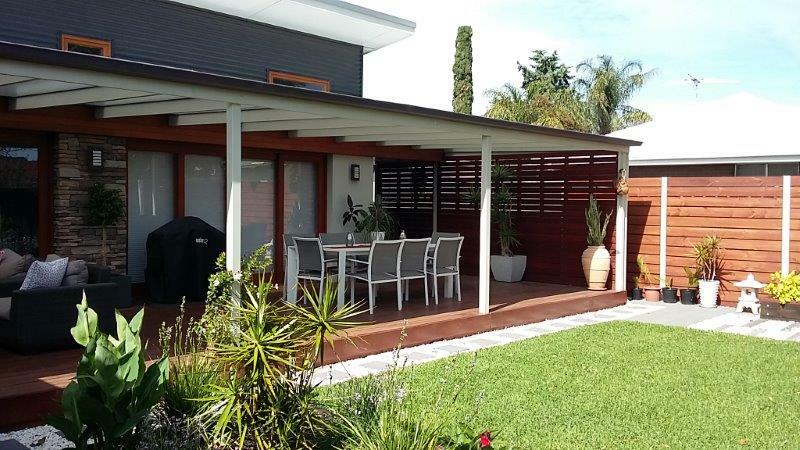 The whole back yard becomes one large "Garden room"
Adelaide's hot summer makes it ideally suited to having a pool in the backyard. Concrete pools with a tiled finish may be the most expensive to build but they also are unparalleled in design choice, looks and quality. A pool enclosure will mean that you extend your swimming season as well as reducing leaf litter in the pool. An Architecturally designed pool to suit your site will enhance your garden and become a lifestyle choice as well as a landscape feature. 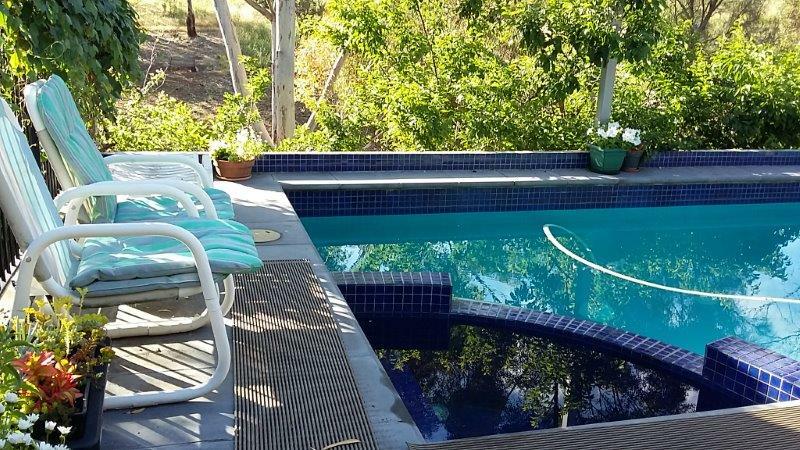 In order to be fully utilized the pool, garden and house should be well connected. One Designer in charge of all three areas ensures the best outcome. This elevated pool in the Adelaide hills integrates a spa at one end and features a raised tiled hob. A raked opal twin-wall polycarbonate roofed breezeway connects pool and house. Garden and pool integrate and merge into bush-land beyond. 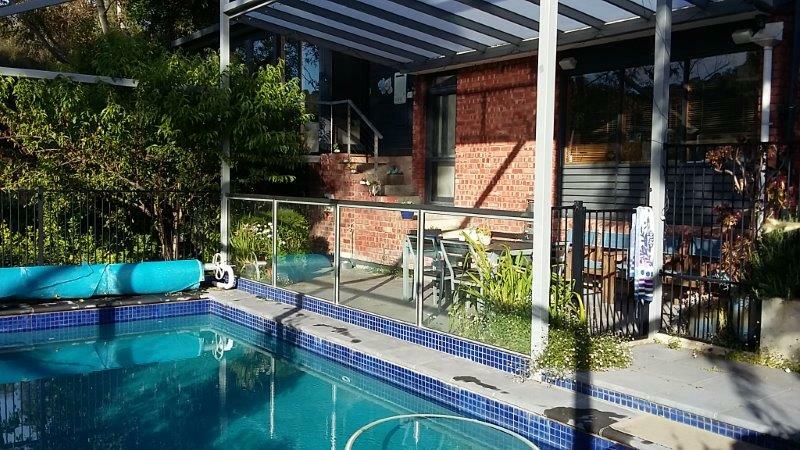 FEATURES: Spa, Split level pool with 2.1m deep water along entire back edge. 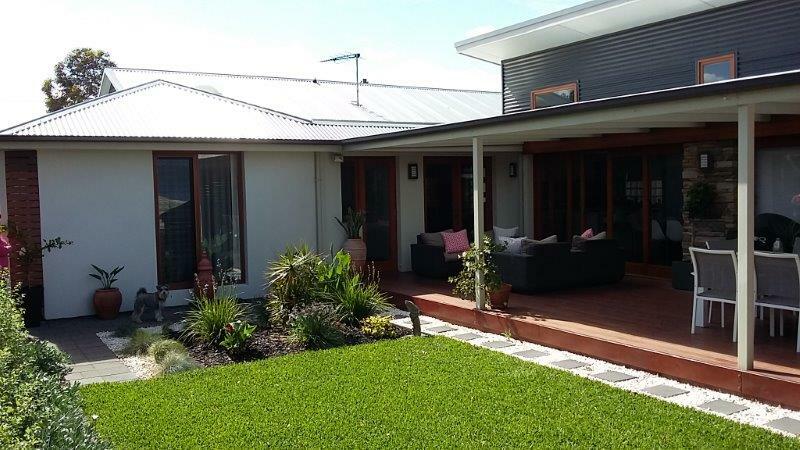 Swim-jets, solar heating, Enviroswim ioniser, tiled waterline with Q-quartz render below, large format pavers. Widened and thickened self supporting band-beam with elevated back and side edges . 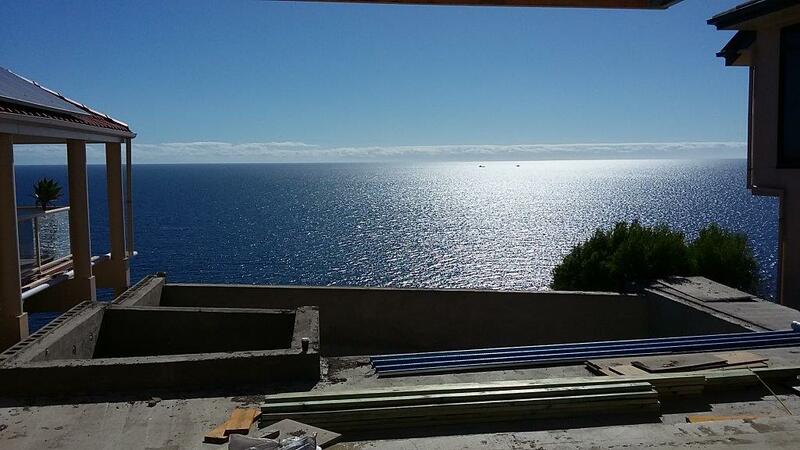 This Infinity edge pool and Pool-house at Marino began construction in Nov 2017 and is scheduled to be completed by Christmas 2018. The pool was designed with an infinity edge to maximise the impact of the 180 degree sea views.The pool-house (with bar) adjoins the main residences living areas, enlarging their party space and providing additional accommodation for overnight guests and family. The plant-room is in a soundproof plant-room under the deck with provision for storage for 20kl of rainwater. Heating is provided by the 160 sqm "Tractile" photo-voltaic roof of the pool-house. The photo-voltaic cell system is also the cladding, there is no separate roof underneath. The cells are encased in water jackets to improve their efficiency. This byproduct of warm water will provide heating for the pool. The roof is sufficient to run both the main house and the pool house. Two Tesla walls will store the power for night time use and excess power will be pumped back into the grid. As this is a world first for this kind of technology I have documented it in a blog of this projects progress as well as a google plus collection of posts and a photo album documenting the build process. 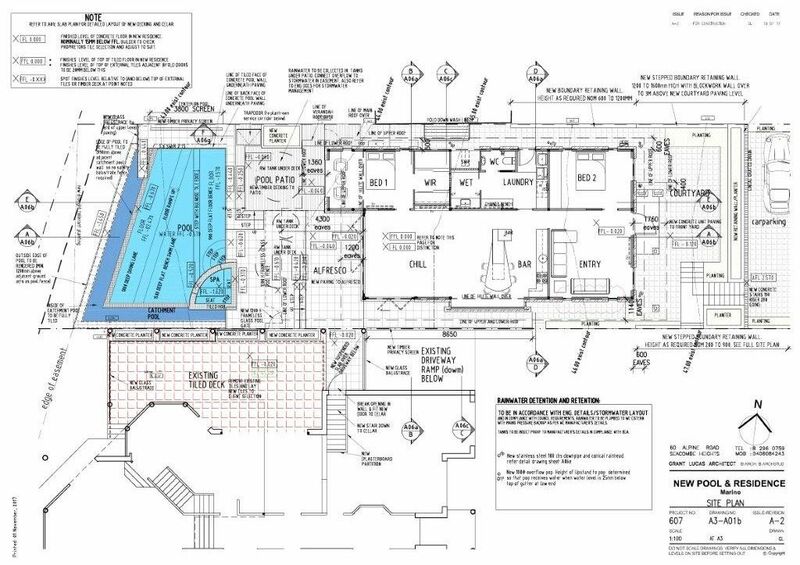 This pool and Spa at Glen Osmond currently is still at Planning Approval stage and is due for final documentation in 2018. It was designed to be integrated with a new Sun-room/Conservatory. The Conservatory roof extends over the pool to provide shade. This pool is all about the view and borrowed landscape.